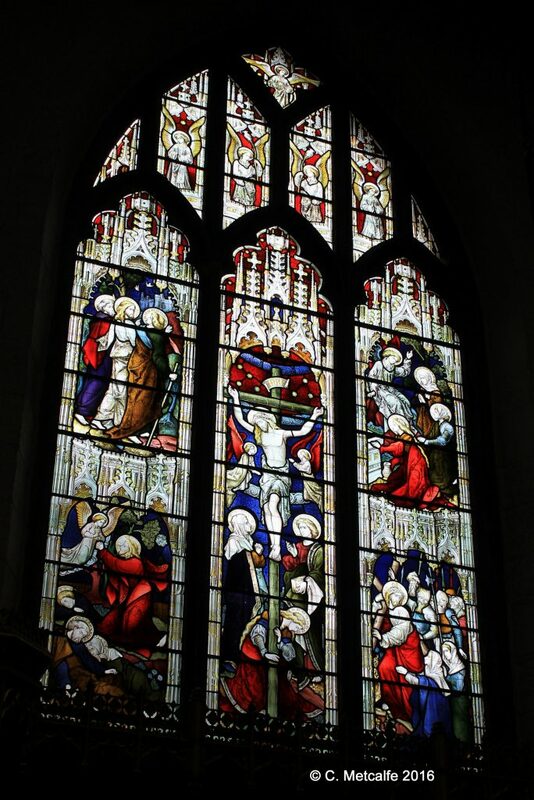 ‘To the glory of God and in loving memory of her parents, the East window is dedicated by Elizabeth H. Clarke, with the consent of the lay Rector, on the Feast of St Michael and All Angels, 1879‘. The window depicts the Crucifixion in the centre, and 4 scenes from the New Testament: The Agony in the Garden, Christ Bearing the Cross, St Mary Magdalen at the Tomb, and the Disciples on the Road to Emmaus. Stained glass windows can be found in other churches dating from as far back as the medieval period. They are sometimes known as ‘the poor man’s Bible’ because they illustrated scenes from the Bible, which not everyone could read, even though they knew the church services by rote. In England under King Edward VI (1549-53) and again during the English Civil War period and under the rule of Oliver Cromwell, (1640s and 50s), stained glass was sometimes smashed deliberately if considered too ‘idolatrous’. This late nineteenth-century stained glass enhances the church, especially when sunlight streams in through the coloured panes. The lay Rector was responsible for the upkeep of the Chancel. Before the Dissolution of the Monasteries, in 1536 and 1539, Lewes Priory appointed the clergy to this church, received tithes and was responsible for the upkeep of the chancel. Following the Dissolution, tithes passed to laymen who were in turn responsible for the upkeep. The lay Rector at this time may have been the Rev’d C.W.P. Crawfurd, or a member of his family. The Feast of St Michael and All Angels is on 29 September. Traditionally, Michaelmas marked the end and the new beginning of the husbandman’s year. Where was Frampost? According to Google, it was on the West Hoathly Road. The 1881 census has Rebecca Worael Clarke and Annie Barroiw Clarke, (complete with the quirky spelling), sisters, aged 42 and 39 respectively, Iiving at ‘Frame Post House’ with 3 cousins and 8 servants. They may, or may not, be connected with Elizabeth H. Clarke, the donor of the East Window. She was a generous patron, and the coloured glass is very beautiful, letting in light and illustrating scenes about the life and death of Jesus.